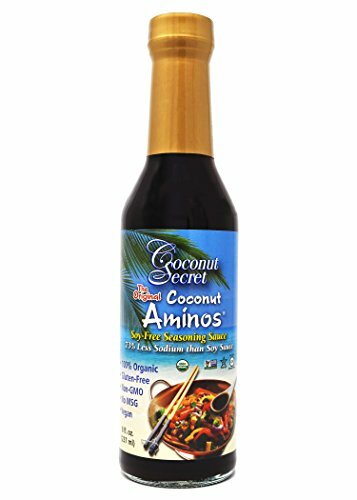 A product review of Coconut Secret's The Original Coconut Aminos. Organic Coconut Tree Sap, Sea Salt. Organic, non-GMO, Vegan, Gluten-Free, Kosher, MSG-free. I wanted to truly taste the Coconut Aminos so I made a little Buddha Bowl with steamed peas, turmeric roasted potatoes & garlic and simple salted rice. Do you want the recipe? I'll be sharing over on Instagram soon! I was beyond excited to receive and review Coconut Secret's Coconut Aminos. I had heard such good things about it in social media land; and having never been a big fan of soy sauce I thought surely I would love this coconut alternative that everyone raves about. And boy did I! I actually had an immense amount of difficulty not finishing the entire bottle putting it on anything and everything before I could properly review it and photograph it, ha! It is truly is that GOOD. The flavor is hard to pin down. I find it subtly sweet, salty - with an ever so subtle vinegar touch. And it leaves you wanting more! It really complements a variety of dishes; and the spout makes it quite easy to regulate just how much you would like to add to things. All in all, it is a delicious (and healthy!) condiment that only serves to enhance and elevate the most simple and complicated of dishes. I've since had it on: rice, quinoa, eggs, added to hummus, in wraps, on salads, on roasted veggies, and as a dip for spring rolls. And, all of it was AMAZING. I know I'll be buying this product for years to come; and I look forward to hearing your experiences, too.